Norden Goods candles. 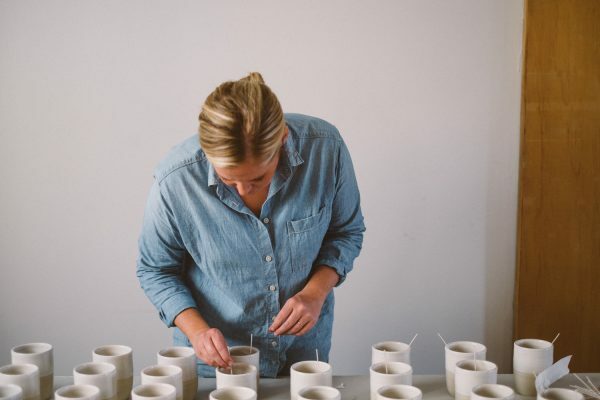 I came across this local, San Diego-based candle brand earlier this year and quickly fell in love with the husband and wife team’s branding and aesthetic and am happy to say the product stands up to the same test. I am partial to the Leucadia candle (a warm, spicy mix of vanilla, orange and rosemary) which is perched on my desk as we speak, but all of their candles, planters and home accessories are minimal in a not-too-minimal way that I love. Drunk Elephant skincare. You have probably seen the buzz on this fairly new skincare brand on social media. And I am here to happily let you know that most of it is warranted. I came across the line via goop (obviously) and promptly ordered the cult-favorite Vitamin C serum that came highly recommended from…everyone. And I love it. I apply it in the morning after their B-Hydra Intensive Hydration gel (I like the gel, but I LOVE the serum) and it leaves my skin brighter and tighter, albeit a tiny bit sticky at first. I also swear it is helping one of my sun spots slowly fade. This one is staying in my skincare regimen rotation and I am going to add the night serum to the mix next as well. I am taking my skincare very seriously these days. Performance is key. Natural-ish is as well. Drunk Elephant delivers on both. It is not all-natural, but it’s close. And that’s ok for me right now, because I need results…big time. Rockets of Awesome. I’ve been meaning to tell you about this one since back-to-school but better late than never, I say! Rockets of Awesome is a new shopping service for your littles that you – and they! – will love. Your kids answer a few quick style-related questions (i.e. pink – love it or hate it? dinosaurs – super cool or super lame?) and they curate a wardrobe-in-a-box custom tailored to your kids and their tastes. Fun, right? And the best part? We LOVED everything in our box. You only have to keep the pieces you want and you simply return the rest but every single piece in our box was a hit…and they have all held up to multiple wears, back-to-school nerves and my daughter’s very picky (no pink or lace, please) sartorial standards. Oh, and I love that their pieces feel unique on the playground unlike most of the other usual suspect brands when it comes to kids’ wear. Eden’s Garden OK For Kids. I’ve been using essential oils for a few years now in our home and I have always loved the benefits, but not the guesswork when it came to safety, especially where my kids are involved. Eden’s Garden is a southern California-based oil company that I have used for a while now simply because I loved the quality of their oils and that they aren’t a HUGE brand like most of the others that feel very sales-y to me. And now I love them even more because they recently launched an OK For Kids line that features custom synergy blends that are just for kids – already diluted and ready to go. No guesswork involved. We especially love the roll-on options because they are mess-free and my kids can apply them themselves (with supervision, of course) when they need them. The blends are super cute – Bee Happy; Focus, Focus, Focus; Study Buddy, and more) – and make it easy to mix and match the right ones for your family’s needs. Finally, Love & Salt Beach Spray. I’ve tried several “beach-y wave” sprays in my time and I have finally found the one. This spray (created by a small indie brand, which I love) is the first one to really deliver the gritty, wave-y, piece-y look for me that all the others promise. It smells lovely, leaves your hair feeling soft (not crunchy) and looks cute in my vanity which is always a factor for me. Apparently you can use it on your body as well but I can’t attest to that. My hair would be too jealous. *Note: This post is not sponsored in any way, these are genuine favorites that I love. It does, however, contain a few affiliate links which means that if you opt to purchase a product via this post, I earn a small commission on the sale. But trust me, it’s small. And has no influence on what I choose to share. Ha. **image above via the Norden Goods Journal. Check it out here. Thanks for the Love & Salt recommendation — I tried it and I love it. I started using a salt spray on my hair this summer. But I hated that dry, crunchy feel. Didn’t seem like it could be good for my dry, highlighted hair. You are so right — it feels really soft. This isn’t the first time I’ve taken one of your recommendations and found a great new product. So THANKS! Please keep them coming. . . .